The 12-month forecast through April 2019 (below) shows deficits of varying intensity in eastern Australia, scattered across the north, and at the southwestern tip. Deficits are expected to be most intense in Tasmania, along the coast of South Australia and Victoria, and in Western Australia near Busselton. Deficits ranging from moderate to severe are expected in the Murray-Darling Basin, with some isolated pockets of greater intensity. Conditions in New Zealand are forecast to be relatively normal. Significant deficits are forecast for New Caledonia. As is apparent in the map series above, the forecast indicates that the exceptional deficits which have dominated a vast stretch of Australia in prior months will nearly disappear, though deficits of varying severity will persist. From August through October moderate deficits, punctuated by more intense pockets, are expected across much of Victoria and New South Wales (NSW), and across northwestern and northern Australia. Deficits are expected to be exceptional in the tip of Western Australia (WA) from Busselton to Albany, and nearly as intense in pockets along the southeast coast near Adelaide, from Melbourne through Canberra past Sydney, and in Northern Territory (NT) near Darwin and in the Daly River region. Moderate deficits are forecast for much of the Murray-Darling Basin but deficits may be more intense near Riverina and Wagga Wagga. Deficits will downgrade overall in Tasmania but will be intense near Hobart and the Derwent River region. Surpluses are forecast for the Mackenzie River region of QLD, and on the opposite side of the country in southwest Kimberley region of WA, with conditions of both surplus and deficit as transitions occur. In New Zealand, primarily moderate deficits are forecast for central South Island. Deficits north of Auckland on North Island may be more intense. Deficits in New Caledonia will downgrade slightly, but remain intense. From November through January deficits are expected to shrink considerably, leaving merely mild deficits throughout much of Australia. Extreme deficits will persist, however, in the southwest tip of WA, and primarily moderate deficits in the southeast near Adelaide, and in Victoria and NSW. Deficits will downgrade in Tasmania and New Caledonia, becoming moderate to severe. Moderate deficits will emerge in North Island, New Zealand while relatively normal conditions will prevail in South Island. The forecast for the final months – February through April – indicates a pattern of deficits similar to the preceding three-month forecast, along with the emergence of some moderate deficits across northern Australia. 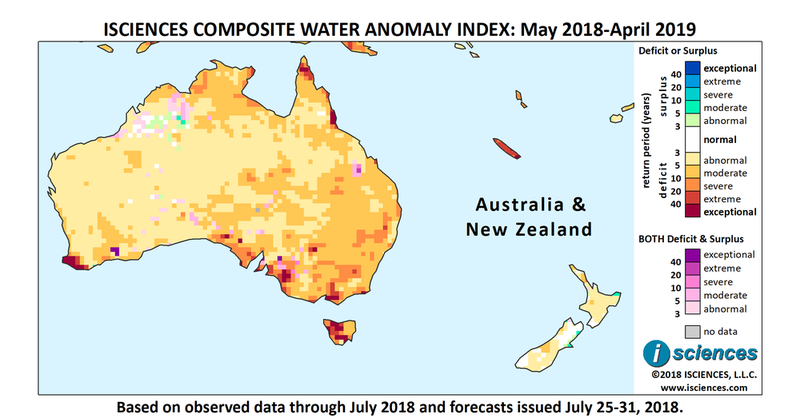 Last month was Australia’s fifth-driest July on record - the driest in 16 years - and marked seven consecutive months of below-average precipitation. Indeed, despite some recent rains, all of the Australian state of New South Wales is in drought. Expectations of a warm dry spring are worsening the fears of what farmers are calling the worst drought they have ever seen. State officials announced an assistance package worth $500 million (USD 370 million), though farmers contend that it won’t be enough to relieve financial burdens caused by the drought. Of 800 farmers surveyed recently, less than half reported confidence in the future of Australia’s dairy industry. Australian pub patrons are offering their own form of support through the "parma for a farmer" campaign sweeping the nation: for every order of chicken parmagiana, popular pub-grub in Australia, a portion of the sale will go towards the purchase of livestock feed for affected farmers. The current "dry" has also sparked unseasonable winter bushfires. According to the New South Wales Rural Fire Service Inspector, the size and number of fires this winter in Australia are more typical of late summer. New South Wales is Australia’s most populous state and accounts for a quarter of Australia’s agricultural output. A new study has found that the flash flood risk in Australia has increased over the past 50 years due to an increase in short, intense rain events. The amount of water falling in hourly rain storms is increasing at a rate two to three times higher than expected from the levels of regional and global warming. Study authors further noted that the increase is “well above” what engineers consider when planning for floods and designing infrastructure. A statistical temperature forecast recently published in the journal Nature is predicting a series of unusually warm years in New Zealand, even before accounting for the impact of climate change. The model was validated by assessing its performance in hindcasting from 1880 to 2016. Cleanup from a heavy storm in New Zealand’s Tolaga Bay in June is now expected to take two years and involve complex engineering repairs to roads, farms, and properties, onto which roughly a million tonnes (1.1 million tons) of forestry slash washed up during the storm.